Freckenham is a small village with some 150 houses in the parish, most within the village. The shop, post office and garage have all closed over the last 20 years or so but one of the two public houses still remains. The village is surrounded by fairly light, but fertile, arable land mostly farmed by three farmers. A portion of the village is a Conservation Area; this starts round the Grade II listed church, along Church Street to Pound Corner (site of the village pound in years gone by), partway along The Street to include the local pub [Grade II Listed] and along North Street. Near the church is a mound surrounded by a deep entrenchment, supposed to be the site of an ancient fortification reputedly attributed to Queen Boudica. Neolithic remains, such as shaped flints, are evidence of early man's activities in the area; a flint axe was found half a mile east of Freckenham House in 1884. 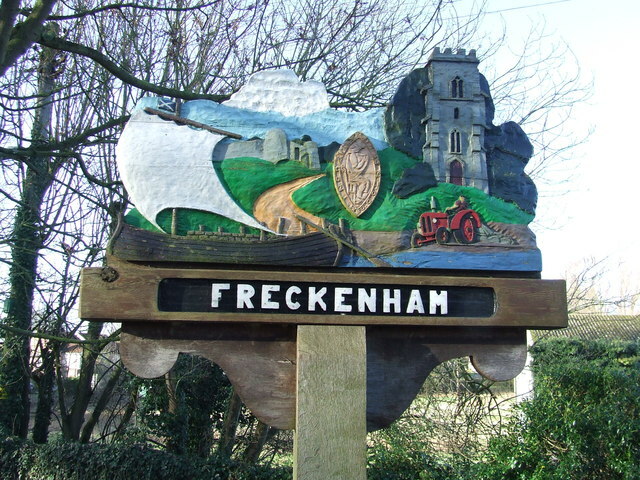 Freckenham was very well placed from a survival point of view when survival was man’s main difficulty; on three sides the village was protected by the vast marshy Fens, impenetrable to those without local knowledge. On the fourth side the earthworks in the field by the church provided means of defense. It is likely that the earthworks here were some 15 to 20 feet in height, gradually settling with the effect of rain and earthworms. This protection and the light, easily-cultivated soil made the site an attractive place to live. Conjecturally the village's name may derive from FRECENA, Saxon for "the home of strong men or warriors".